Cut all the fins without forgetting the dorsal fin, and then open them like a book and remove the bones gently without breaking them. Make sure you have removed everything that is not clean pulp then wash them gently and place them to drain lie flat without overlapping. Put to soak the raisins. Freshly toasted pine nuts in a pan with a little oil. Put in a bowl the bread crumbs, parsley, orange zest, the caciocavallo cheese, 2 tablespoons of olive oil, the juice of half an orange, salt and pepper. Grind the toasted pine nuts coarsely in a mortar. On each Sardinian on the belly side put a bit of stuffing and a bit of some pine nuts and raisins. Wrap them to form a cylinder, leaving the tail upwards, which imitates a bird. 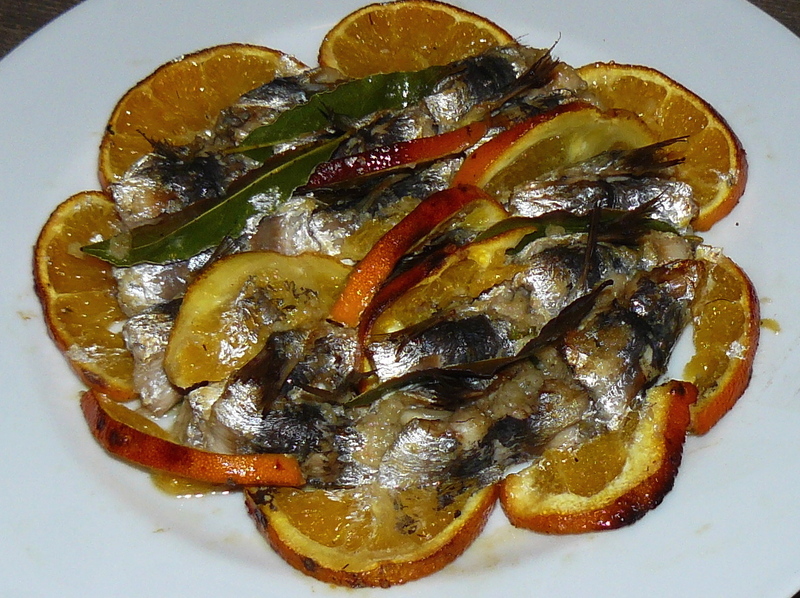 Place the sardines close to each other in an oiled dish and separating them with half slices of orange (cut into half-moon) with the skin, alternating with bay leaves. Put in the oven at 180 degrees and cook for 5 – 7 minutes.